As a tribute to all the dads out there, we here at Red Sox Life would like to extend a special Happy Father’s Day to you. We have a few submissions from our writers of our favorite Red Sox memory with our dads. Enjoy! I’ll try to make these short, as I have two special Red Sox moments with my dad. First was in Atlanta, when the Red Sox visited the Braves back in July 1999. It was the moment I turned from a Braves fan to a Red Sox fan. You see, growing up in the South, the Braves are your team. 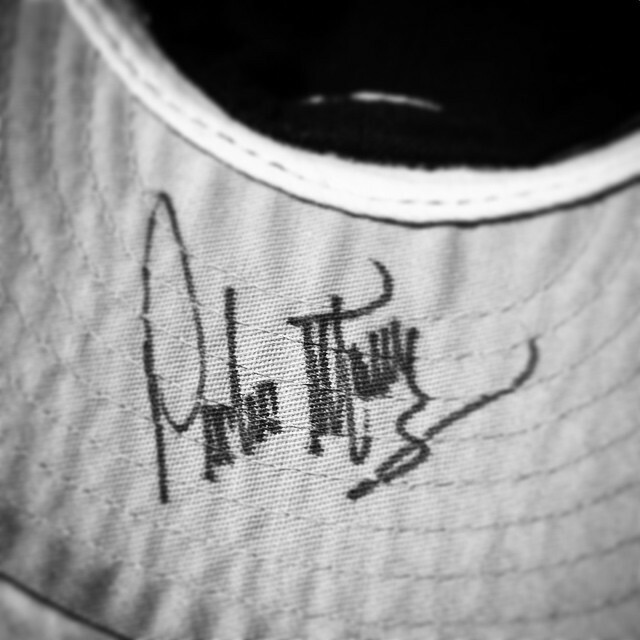 I was a Chipper Jones/Greg Maddux fanatic and I loved doing the “Tomahawk Chop.” But things tend to change when a Hall of Famer signs your hat. My bro and I obliged. We each got an autograph and ran back to our seats with smiles on our face. Dad teases us all the time about how we had to say "Please Pedro! Please Pedro!" A few nights later, I watched the All-Star Game on TV. Needless to say, when Ted Williams was driven in and Pedro K’ed five of the first six batters, I was hooked. My second favorite memory was my first trip to Fenway in 2012. My dad and I planned a trip to Boston and to go to a game for my 25th birthday. When the schedule came out for Fenway’s 100th anniversary and I saw the Sox were playing the Yankees at home on my birthday, it was a no-brainer for my first pilgrimage. We went to three of the four games (bought the entire series, but a rained-out game from earlier in the year was added). We did it all in Boston that week – from the Freedom Trail to eating Regina’s Pizza in the North End to visiting Harvard. Everything about that weekend was awesome, but sitting inside Fenway Park for the first time with my pops at my side is something I will never forget. Happy Father’s Day to all! And thank you, Dad! My mom got tickets for this particular game (Sept. 19, 2001 vs. Tampa Bay Devil Rays) through her job at the time, right behind the Red Sox dugout. Getting those seats wasn't exactly an achievement- the Red Sox were pretty bad that year, and the people at my mom's work were happy to give them away. My dad ended up going with me, and I remember this game because the seats were so good, but also because I got my first (and only, to this day!) foul ball. It was thrown back by one of the coaches and I reacted quickest. That game sticks out because of the seat location and the fact I got my only foul ball to this day. And, of course the fact that my dad was there to take it all in with me. Happy Fathers Day! My dad was born in Parral, México (Ted Williams' family roots are from there) which is a small baseball town. My dad was raised as a Yankee fan and since I was 3-4 years old, he tried to bring me into the dark side, but for some reason that I can't really understand I turned out to be a faithful member of Red Sox Nation. While I was growing up, we used to watch every single game that ESPN or Fox Sports transmitted. I even remember my dad infuriating when Trot Nixon hit that home run off Roger Clemens in his classic duel against Pedro Martínez in a Sunday Night Baseball episode, while I was screaming in delight. I moved out of my parents' house two years ago because of college, so I lost contact with my dad. Every once in a while he texts me making fun of the Red Sox score, bragging when the Yankees win or A-Rod breaks a record. 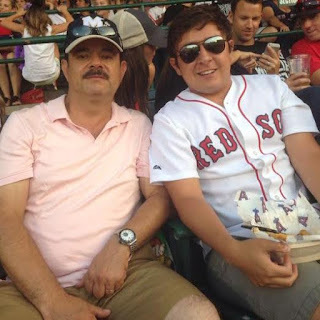 Since he still lives in México, we're not able to attend to a lot of MLB games together, but last year we went to the Red Sox/Angels game that lasted 19 innings. I was wearing a Pedroia jersey and a friend of mine told me that FOX Sports West caught us on camera because my dad was making fun of me when Mike Trout tied the game with a home run. It was really hard growing as a baseball fan in México because soccer is the only sport that everyone pays attention to and I'm not a fan, but my dad has been my baseball buddy for as long as I can remember. Even though he's an obnoxious Yankees/Cowboys die-hard fan, I'm still grateful because he's the man that introduced me to the magnificent world of baseball. Happy Father's Day, Dad! My favorite Red Sox memory with my dad has to be my first trip to Fenway Park. I was only 7 at the time, but still the biggest Sox fan around. Like all little kids, I wanted to be just like my dad. He watched the Red Sox, so naturally, I did too. My first game at Fenway was June 25, 2004. Red Sox vs. Phillies. Pedro Martinez on the mound. Even at 7 years old, I knew how awesome Pedro Martinez was. I was so excited to be at the park with my dad. Watching the team on TV was one thing, but to see them live in action? That would be priceless. It was safe to say I was super excited and ready to see a Red Sox win. Pedro didn't let me down. The Red Sox pummeled the Phillies by a score of 12-1 in a rain shortened 8 inning game. Martinez threw 7 strong innings and got the win. He gave up just two hits all night, a single into right by Placido Polanco and a homer by Jim Thome off the Coke bottle in left. Manny Ramirez, my favorite player growing up, and David Ortiz each homered that night. It was a picture perfect night from Fenway. Sharing that memory with my dad is something I'll never forget. Going to Fenway is great for two reasons: I get to watch the Red Sox play and spend time with my dad. To me, that's what it is all about. It is easily safe to say that if he wasn't such a big Sox fan, I wouldn't be either (for better or for worse). Happy Father's Day, Dad! Baseball had always been pretty big in my house when I was little. Mom was from Brooklyn where rooting for anyone other than the Dodgers was completely unacceptable. Dad was from a coal mining town in Pennsylvania, not far from Scranton where the Red Sox had a minor league team. A good all-around athlete, he was good enough to attract the attention of Red Sox scouts while in high school. As I got older, rooting for the Red Sox seemed like a nice tribute to the team that had taken an interest in my father. I passed on my love of baseball and the Red Sox to my three children; my wife and I have made our various trips from our New Jersey home to Fenway Park part of our annual summer ritual. The only time I ever had a doubt about raising my kids in a Red Sox-obsessed home came walking out of Yankee Stadium after Game 7 of the 2003 American League Championship Series. I called my wife and asked, "What the hell am I doing to these poor kids?" Needless to say, 2004 erased those fears; 2007 and 2013 didn't hurt either. Like thousands of kids, my son dreams one day of playing in Fenway Park. We've spent countless hours discussing what it will take to actually make that a reality...and no doubt part of our Father's Day discourse will center in some way around baseball and the Red Sox.